Boosterism is back. It actually showed up in a big way after Katrina. It was quite understandable as as a proposition at that time. The desperation of the situation allowed for people to dictate unchecked about the need to sell New Orleans to the world in order to get funding for development. Everything about the situation was in need of serious help and whatever music could do was a great thing. Many musicians from the city were involved in the effort and were on tours to help with such a promotion. They were, of course, particular musicians that were moving that very targeted, romanticized, picture of what New Orleans is in the collective imagination. This was historically the way New Orleans got into tourism in the first place- painting pictures and promoting the images- and, in fact, that huge city industry was, in fact, at risk. Hotels, Mardi Gras, Voodoo shops, Bourbon Street…the whole picture needed to be saved because it does, after all, bring a ton of money to the city and provide a livelihood for a good deal of the population. The city relies on it for survival. The comeback is well underway and music no doubt contributed. Most big American publications have shown it to be so with articles and features, and there is no doubt about visible development action everywhere in the city. And that word, ‘development’, seems to be everywhere in articles and on peoples’ lips, with both negative and positive tinges. A casual stroll through the Marigny and Bywater will show how much is going on. Developers, and politicians in favor, are themselves quite visible through websites and meetings so most people have some inkling of who the involved players are. Boards and commissions have a sneaky way of containing a lot of the same members around this city, so the major players’ names are showing up frequently. There have been many results. As New Orleans neighborhoods develop, outsiders – coming from a relatively depressed America – are moving in. These newcomers are drawn to an old city of myths on the Mississippi with a low cost of living and a government that’s willing to bend over backwards to support new, glitzy businesses. New Orleans is, after all, a great place to live. Especially if you like food, music, and being able to spend unmorally checked amounts of time in endless conversation with your neighbors (-a very civilized occupation, I might add!) Most locals, like the populations of most modern port cities are beyond many narrow prejudices about insider and outsider—although that ugly specter (and some far uglier vestigial specters of the past) sometimes appears a little faster in such rapidly changing times. In with this, comes the more recent language of gentrification and, that is a significant term to be thinking about in relation to music since neighborhood property values tend to rise by riding on the lifestyles of artists, musicians, and craft people in general that have been seeking affordable living while they (do what the business world high and mighty’s think is their sole province) invest- in developing their artwork. New Orleans can boast a huge history of top tier artists struggling but surviving. The city is still teeming with them. There is always new stuff going on. But there’s an old story afoot: property values rising and those poorer artists get priced out of their neighborhoods. In the current art climate of the United States (and New Orleans is really not an exception) most of those folk stay pretty poor. It’s not the case for all artists and musicians. There is a lucky option for some- it is possible to put development on hold, don what duds are needed and go to where the wallets are walking to get at that money- if you are interested in or trained, to play in those styles. If not it’s a little harder to get things going- for a number of reasons that we’ll come to shortly. But, if you are willing to engage in a bit of unbridled modern boosterism and provide some tourist friendly art in the entertainment zones things can go somewhat better for you these days than it was going for a while. This, however, can pose some real paradoxes in art and music development. Especially where it has become a little more sustainable to blow off ‘developing’ any art and, rather get art to add to, and be in service to, the greater property development of neighborhoods and the image of the marketed-for-tourism New Orleans. Since the city has clearly defined entertainment districts, it’s easy for the tourism industry’s propaganda to point visitors toward these districts when they seek that that prized item in the New Orleans cultural bag — music! They might even be looking for that hallowed authentic kind- New Orleans Music. The brochures and concierge services have told them where to find it and the clubs in those areas are permitted and setup to procure the entertainment image of the city. New Orleans is very geared toward the cultural tourist and all research shows that investing in cultural tourism is a lucrative proposition. The National Assembly of State Art Agencies website says “Cultural tourism is an important way to celebrate, preserve and promote a state's unique heritage, increase opportunities for artists, promote public arts participation and boost economic development.” New Orleans and Louisiana have been invested for so long in selling cultural tourism that both the problems and the rewards of the industry are likely to become evident much sooner than in other cities. All research indicates that the tourist seeking cultural authenticity has more money and is willing to shell out more for it. That’s not such a bad thing in and of itself. In a way it is a blessing, people who are seeking the real aesthetic contributions of a region and are interested in strongly embedded local people and what they produce- just to soak it in, contemplate it, be somehow edified by the addition of variety to their lives and, furthermore, pay for it! The rewards can be rapid. A place, or pockets of a place, initially impoverished and unclearly defined undergoes a self-conscious folk awakening and realizes that it has habits, heritage, and idiosyncracies that may be attractive to someone known as cultural tourist. Sometimes a location or group of people is identified by an external, objective folklorist and sold on the idea of cultural tourism as a system of preserving a, now clearly identified, unique way of life. The payoffs of cultural and heritage tourism can be very hefty. So much so, that a large chunk of this city’s money is yearly budgeted to invest in it. A casual walk through many of the busier neighborhoods in New Orleans will reveal to any stroller how many businesses are trying to point their prow as deep into the radius of attention of that curious cultural tourist as possible. Revenues from taxes, permits, tickets and all the rest of it contribute to that section of serious city investment. If you look in the city budget – which is available at nola.gov – you can somewhat follow the money, though the actual document is a bit esoteric. A lot of city support for these things, tourism etc., so far as I can tell, comes out of something called the general fund. The general fund gets revenue from a lot of places. Amongst them, (just keep this in mind for later) permits and operating taxes. (Much to his credit, Mayor Mitch Landrieu has said that because tourist commissions are getting public funding, they must be more accountable and transparent about how they spend their money.) Staring at the city budget while the real world goes on around you can really get you to some interesting realizations. The city spends 61% on security and 1% on innovation (and it’s hard to tell what, in that bracket, is innovative.) That speaks miles about the actual operations of the city. It really is mandated to be more of an enforcer than any kind of patron, but some support is given in worded understandings of the importance of certain kinds of development and innovation. In short, the city gives a huge amount of budgetary support to the tourist industry. New Orleans is far from being the top cat in the game, although it is often cited as being a major example of a way to really work it. At the international level the government even has a task force working with an organization called Brand USA to market the whole nation to cultural tourists of the world. Not surprisingly, their organization’s website does show one photograph of some authentic USA music going on and, (as you quite possibly could have guessed,) it’s a street band in New Orleans, on Royal St.
On the other hand, there did used to be more bars with music randomly scattered around town. In Treme (the neighborhood), for instance, there were lots of places like the current Candlelight that had music many nights of the week with interesting and great local musicians playing for local people. I know this because I used to play in lots of them from uptown to downtown with folks like Kermit Ruffins, Walter Payton, and Frederick Sheppard in the early nineties. It is curious how many of those places were shut down or hassled soon after Kermit got in there or had a regular gig there. It still happens to him too. In a city where this man is a folk hero both overground and underground it is curious that so many of the places he has been through are closed down for various sorts of licensing infractions. It looks a little like Robin Hood gaining rewards and acceptance but the sheriff still insists on chopping down every inch of Sherwood Forest where Hood’s work and livelihood originate. Since there would have been many different sorts of organized sound, or music, coming at them they might begin to question why and how the music exists in their city in those forms. They might see how the music evolved because older, knowledgeable musicians in their city could play fascinating and varying examples of music they had been exposed to, in the community, throughout their lives. Certain sounds might then acquire heightened meaning in that their usage could be seen to have a relationship to particular events and repeated scenarios where emotions were running high; where there were incidences of significance or incidences that could be translated into some sort of sonic information or imitation. Through combination in the hands of skilled musicians, sounds could simultaneously contain history by connoting other places and times and, added new meanings by how the sounds were being currently used in any moment, or the style in which they were being employed. New Orleans could be looked at as a place with these sorts of features in the music. Actually it’s place with that process going on within a number, and extraordinary number, of localized different musics coming out of groups of musicians in the city. In the above imaginings, however, we are proposing that there is a population of listeners that maybe doesn’t always well resemble the NOLA population. A feeling sometimes arises that the music is more for showing off to the outside people than for the residents to bask in and contemplate. That feeling can be hard to stomach. The reason it’s hard to stomach is that a good deal of the development of music in the city comes from the emotions associated with real struggle and the need for survival. It gets demeaning (literally in the sense of removing meaning) to imagine that the music from Congo Square, to Gottschalk, to Jelly Roll Morton, out through Rhythm ’n’ Blues, Funk, James Booker, Kidd Jordan, the plethora of ace hip hop artists, rockers, and songwriters and all the rest- was really just a large period of development to get content together for a tourist industry. It is an unfortunate feature of the history of this city that its artists were always being forced by city and state laws to find some new way for their art forms to survive. The story is old- trained classical and improvising musicians being forced out of jobs from new segregation laws. The music surviving and mixing with other influences in environments like Storyville, then that being closed down forcing other mad attempts to have the music survive. Do we want to keep throwing up roadblocks? It is uncivilized and failing to learn from history to view the music as wallpaper for the venues that it is forced to operate in, as if jazz or whatever music is coming out of those places is merely content for them. It can get absurd- imagine the idea that Jelly Roll Morton was an interior decorator or (ha!) sound designer for the establishments in which he worked. And, even if it was true...is that the way we would want it to continue? It could be argued that the world of arts and ideas is currently clogged, and our lives de-humanized, by just this content problem. If a piece of music is on YouTube it is YouTube that grows, not the significance of the piece. The contents of the itunes store all become fuel for the aggrandizement of Apple. A lot of updated modern festivals work that way too. The artists and their work are subservient and driving content for the name of the festival. This can point to some serious difficulties in creating or understanding meaning. It’s too easy to imagine, for instance, an aging chap in a Ramones t-shirt at Jazzfest, listening to Springsteen playing some piece from “Wrecking Ball” in the background while he complains from his income stratified Big Chief seating option about what it isn’t getting for him above the regular ticketed experience. And this at a festival that is built on a ton of artists, now legendary, that made a ton of music (with heavy rhythmic and social appeal) with negative overtones or downright attacks on the horrors of class and income stratification. But, perhaps you pay extra NOT to have to listen. Music only conforms and behaves when it is enforced or its producers, the musicians, are rewarded to keep it that way. Otherwise, music evolves. It evolves because the musicians evolve and their lives are impacted by everything they come across which changes with each generation. Without massive interference, it changes fast. Some of the greatest features of the art form are in its dealings with time and rates of change, contrast and form. It can change mood on a dime and, in good hands, can cause the sound alteration to cause deep emotional changes in the listener. Since it has this characteristic, of non-static rapid change, it can very quickly take on, and be adapted to fit, the new stories, rhythms, sound and noise palettes, and other linguistic information of its performers. It can do this both within a single piece or across a fifty year intentional or unintentional development. Wow! But…Isn’t this what we would want out of an art form. Music would have little use to us, and we would have left it on the discard heap of history if it wasn’t flexible enough to contain everything. With the exception of clones, most things in nature are a one off. Certainly people are. Music must be able, potentially, to capture the individual vision of each artist, or group, or we would probably have moved to more adaptable arts a long time ago. But, as it turns out music is flexible. It has been used for everything from systems of measurement (pythagoreans) to cypher systems (check into the enlightenment and renaissance), to advanced linguistic coding systems in sound (look all over the world, especially Africa), to pop ideas for selling hair products, to a battle tactic for scaring the bejeezus out of the enemy. It has even been made to seem one way to some and have a totally different meaning to those “in the know”- who strangely… aren’t the elite, but the common man himself, where it was the church that was removing humanity. There is much more. I mean, you can do anything with this stuff. These are only a few of its potentials. It can contain quite particular messages of an individual or collective messages of a group culture. How does it contain messages? It contains them by its individual pieces- e.g. songs and compositions- being symbols; collections of gestures that have understood connotations for the listener or performer or both. One of the reasons that music is such a force in New Orleans and, that it does survive is because much of it is attached to life cycle events; birth, weddings, seasonal celebrations and, so rarely in this part of the world, death. Second-lines, brass bands, Indians and their song etc. The local music in this form is a main artery and lifeline for the rest of the music culture in the city. It’s meanings are understood because of direct connection to inescapable events. New Orleans almost has greater leeway because of this colossal musical and spiritual blood supply. Understandably, it is in concert situations as an after thought. A second-line is not really a concert. In fact, even within concert jazz, a second-line or funeral is often a gestalt that is depicted or explained rather than performed (see Louis Armstrong for examples.) The emotional realities of the times at which a musical event such as a second line occurs are not something that can be, or would desirably be faked— inauthentically. This brings us back to authenticity. It yet remains a question- especially if you are selling it! If authenticity is what is valued by the spender, then they must be able to find it. But what is the real thing in a place where music takes so many forms and in this town more of it is going on than there are venues for it to be performed? And, in fact, if you were to go out every night and take a listen to as wide a swath of the nightly offerings as possible you would find that most of it doesn’t conform to the model offered by legend and tourist industry boosterism. There are more paradoxes— if you want to create a district for preserving something or showcasing something you are creating a place where normal developmental pressure is actually halted. Music, however, is something that is always developing and doing so very rapidly when unchecked. For the amount of music that New Orleans boasts, and in reality for the amount of music being created there isn’t enough room in those districts to present everything and it isn’t necessarily the best place for all music to be played. Entertainment districts certainly are a questionable environment for musical invention since the tourist crowd is often too transient to hold on to musics that aren’t what they thought they were trying to see when they left the hotel. So, what really is music to the people of New Orleans? Not to the cultural tourist, but to the people in the city? How do the residents value music? Outside, there is a presumption that we value it highly but, how much do we value it, not as content for another industry or even a music industry, but for the art of it? And not really for an art for art’s sake type of aesthetic either. In a way that is a castration of a most powerful thing in art and music: its real relevance to our understanding of ourselves AND our relation to society. Mostly, it is the forces that cause it to come into being that give it depth. In the entertainment zones where performance is given fairly unlimited restriction the clubs end up being fairly limited in what they show. They have mostly ended up carrying the sanctioned music that relates to cultural tourism. That is smart for the businesses there since that is what most fat wallet carrying tourists have gone there to see. Some of the music going on does have some substance to it. The rewards for musicians getting into playing in these zones are good. It is steadier work, and it involves some classic styles with historical fascination, its got a beat and you can dance to it. All good so far. It turns out though, that much music is developing in many other areas of the city and doesn’t look like the stuff in the entertainment districts. It could be right there at sometime in the future, but right now it’s probably not the right venue. The issue of venue is a difficult one. Musicians are frequently performing artists (they aren’t always- check the Beatles and Glenn Gould) and most of them, when they haven’t totally been beaten into apathy, have some ideas about how and where it would be best to present their performance. It is as much a part of the deal as a gallery is to visual arts. Anywhere music is going on becomes a kind of gallery. Bars can be more desirable than performance halls, a porch or flatbed can beat a supper lounge and, it can also go the other way. It depends on what is in the mind of the performer. This understanding of music bars as galleries could be a very useful model. It is also accurate. Any place with music is a gallery, but it’s artwork hangs in a different sensory field. Just like galleries they can get to be showing some really strange and difficult stuff, but just like in galleries, the exhibits rotate. The variety is what allows for the useful value of ideas to play out for the folks privileged to experience them. In New Orleans, as with many cities, there are a large number of musicians, writers, architects, painters, and more working in music bars. Special things can happen when those folks decide to get into owning a place because they tend to move a bar into being a more plastic space with all sorts of parts of the business undergoing development. There are a number of these sorts of places currently and in the past. They crop up all over town and serve all kinds of people. It is an interesting model because the establishment is meeting their artists, like in galleries, with a good deal of understanding which helps to contribute to the development of real vibrant music scenes. Recently there was a good deal of hullaballoo over the permitting difficulties that arose for The Circle Bar, Bacchanal, Siberia- and there are noise difficulties for a few others. More recently, Mimi's in the Marigny has had its music halted by the city. Two of those places are artist run and owned. The Circle Bar got its license back and Dave Clements (musician) of the Circle Bar said that he didn’t feel that in dealing with the city that "There did not seem like a concerted effort to squash live music." Here is part of an interview with two of the owners of Siberia, Luke Allen and Meghan McCracken. They express clearly what their view is of the type of club they are dreaming of developing. Incidentally, they also remarked repeatedly, like Dave Clements, in an earlier part of their interview, about how helpful the city and Kristin Gisleson Palmer’s offices were being in helping them process their permits. J: Why did you decide to get into having a club? L: Meghan and I had actually been looking at the possibility of opening some sort of bar, or a restaurant in town. We had some savings. We were actually looking around at buildings at one point. We looked at the old First Imperssions [that was how it was spelled on their sign]. It turns out that Matt Russell, and Daphne Loney had started Siberia. They had a bit of a shuffle and a change- one partner was getting out and after that they invited us to come in. It was just a great opportunity to actually buy into the building and buy into the business. It was already functioning. It wasn’t exactly the kind of music that I’m into as you know, necessarily. 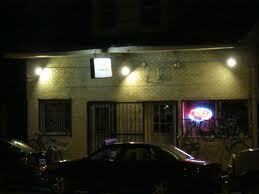 I’ve been around a lot of punk and metal through Circle Bar [Allen previously bar-tended there.] I’ve known Matt “Muscle” through his different bands- Mangina, Tire Fire, now he’s in The Classholes. Daphne Loney was my manager at Mimi’s and she’s involved in the arts and stuff. And I just know them both really well and it seemed like a really good fit. The money was right. Meghan McCracken: It came along just at the right time. L: They were recognizing that they had a really good niche with the kinds of music they were doing but I have some more connections with other kinds of music than punk and metal and it was an opportunity to come in and then you know… Meghan’s been involved with theater in town and that’s another possibility. Meghan McCracken: We were looking to broaden the vision of the place and they were looking to have a broader vision of the place. L:…or am I going to die working for the man or you become the man! Meghan McCracken: Luke has a lot of connections to the local music scene and I’m good with business stuff…kind of…if I do say so myself?! Meghan McCracken: I’m not sure if New Orleans can sustain a 7 night a week Punk/Metal club profitably. I’m excited about what’s happening in the neighborhood so we decided just to jump in. L: Pretty soon after we started the kitchen. They were running their own kitchen and it was a struggle for them to do that. My friend, Matt the Hat, who I’ve known for years- he was at Fiorella’s when Bingo! started. He was working the kitchen there. He’s of Ukrainian descent and has been doing little pop-ups here in town and he was in Minneapolis doing popups with that sort of food after Katrina. Polish-Ukrainian food. I found out he was interested in maybe doing something. And that’s right as we emptied our kitchen. The luck of having a club called Siberia and bringing in that kind of cuisine! Meghan McCracken: They had this sort of theme going and this musical niche and then we’re just sort of improvising on that. Jonathan Freilich: How did they end up that theme? Luke Allen: Because that is the kind of music that Matt Russell likes. Luke Allen: Oh! You mean the club name. I think just because it’s in the middle of nowhere. Also it’s funny because it’s such a hot town. Meghan McCracken: I think the theme they were going for is like rock’n’roll winter lodge in the middle of this hot tropical place. Luke Allen: I think they were going to bring us a taxidermied squirrel. Meghan McCracken: I think he’s putting in a bear and a deer. Luke Allen: I like Punk and Metal but I wanted there to be different kinds of music. Jonathan Freilich: It seems like there’s lot of variety there. Meghan McCracken: right before this licensing thing Luke was booking a lot of early [in the day] shows Thursday through Sunday. Luke Allen: Different DJ’s, different performers. Luke Allen: …the same bands playing the same sets. Jonathan Freilich:…so it’s a relief to see a club booking whoever’s got something to show. Meghan McCracken: I can tell you. I worked on Frenchmen St. For seven years and I can tell you why people start niche booking because I can see how much work it is for Luke and Matt trying to book a club. It’s not something you get rich doing, it’s a labor of love and it’s really hard so we’re trying to balance booking these touring bands that are coming through with local stuff. Not necessarily having a cover every night. We’re trying to do that nearly impossible thing which is to be a night club and a neighborhood bar where people want to hang out. During this little window of time where we are straightening out our licensing stuff we’re trying a lot of new things. Luke Allen: We’re going to be doing some weeklies up to the point of on Sunday nights we’re going to have a movie night; comedy night on Mondays, Trivia night on Tuesdays; and then a dance night on Wednesdays. Jonathan Freilich: I think that’s great! You know it’s a funny thing because I think that the weekly has a two sided potential. There’s the weekly that you book because you’re too lazy to deal with the situation and the weekly that you have there because you can build up a certain kind of following. One is allowing something to develop and the other is flat out apathy. Meghan McCracken: For years the same night of the week, the same bands, would play the exact same sets over and over again. It’s mind-numbing. That’s one of the definitions of hell: the same thing over and over again. Jonathan Freilich: I think you’ve got a good point there. I think people should push to change things or go away until they come up with something new. Luke Allen: it just doesn’t matter at all. Meghan McCracken: but obviously then any kind of local scene is going to get tired of it. Luke Allen: but then it’s like the guy on the street singing Stand By Me. Maybe he only knows the first three stanzas of Stand By Me but it doesn’t matter ‘cause the tourists keep on passing. So you can just know half of one song and make a living. Luke Allen: it’s like the food scene. Are you making etoufee or are you making gumbo, or are you just making a goddamn good steak. Meghan McCracken: Or innovating or creating. You encounter some inertia. But doing this though now [running Siberia] it’s much easier to encourage that. Luke Allen: and maybe the owner of the bar should blow me as well because I think that would be just about right. And I deserve it! You know why? Because I’m a talented musician! I’m a gifted man.” And now I see it very differently. The importance of putting this interview in is that it shows places of real art, and idea development potential, way outside the beaten path of most of the officially sanctioned entertainment zones. Everywhere there is talk of developing the St. Claude Corridor where Siberia lies. But, looking at the value and the values expressed can there really be harm in allowing bars such as Siberia to thrive all over the city. There is music development there and people, as I said earlier, are quite hot on this word ‘development’ right now. There is also a certain humanity revealed. There is a common ground meeting of the owners where the artists have to function. This is not to suggest that it has to work that way. It would be ridiculous if all bars had to be run by artists. But in this interview it is clear that the owners are quite happy with being business folk and the lessons and fresh understandings that derive from that. The singular guit-artist, Dr. Eugene Chadbourne once wrote an interesting book relating to all facets of being an independent musician. The book is titled ‘I hate the man who runs this bar!” It is subtitled ‘The survival guide for real musicians.” In the book, Chadbourne describes an A to Z of types of bars and bar-owners in a fable like form. When it gets to M there is a description of a model that describes a bar with some similarities to Siberia. Chadbourne offers the outcome for the business model. “”What a fantasy life,” Moonman said the other day. I’ve never worked so hard in my life. It’s turned my hair grey and taught me the meaning of the word stress like never before…. “They founded the entire operation on the premise that a profitable restaurant can support a more experimental club, not realizing that running the restaurant itself was more experimental than anything anyone planned to do in the club. A club could not supply incomes for the five or six band members, but a restaurant would be able to do this, they thought. “But their venture failed to bring in the kind of money they’d hoped for. The Moons realized that since there was no profit and they owned the business, they were working for nothing. “The club is now breaking even. Because it’s run by musicians (and sensitive, caring musicians at that), it has become a place a cut above the normal club experience. The music is presented in a pristine setting, the layout is designed to afford the best view of the stage, and the crowd is encouraged to enjoy the performances politely. “The Moonies try to avoid the kind of power plays, condescension, and exploitation that characterizes most “big business” bars. When figuring out what percentage to take from the door, the club makes sure that the musicians involved feel the transaction is fair. ‘The attractive cabaret-style setup is also used for theater events and workshops, dance classes, poetry readings, and films. “Overall impression: If you are a musician and serious about what you are doing, you will seek out places such as this, support them with your energy, and contribute to their well-being by bringing your audience there. These kinds of clubs prove that the right kind of business sense and artistic integrity can produce environments much more pleasant for the musician to work in. This could be the future…and wouldn’t it be loverly? For interesting cross reference here is a segment of an interview I conducted with architect, musician, recording engineer, and ex-bar owner, Jeff Treffinger. I am here talking to him about the legendary Mermaid Lounge, which also had several owners all with a variety of talents. He talks about and some features of its development during the period when it was operating and why they didn’t continue. Jonathan Freilich: After you got shut down, how come you all didn’t open another place? Jeff Treffinger: Well the partnership sort of ran into trouble. And, you know, not to get specific but to get 8 or 9 people to agree on anything is ludicrous. I mean, even if you’re a baseball team I don’t think everybody agrees on what they’re doing. But this was even worse. Some of the people, including myself, I mean having kids, and then in 2001 investing in the Truck Farm, so I’m pulled away and renovating those houses. Several of the partners never really kept their responsibilities up, whatever they were, as vaguely as they were defined. You know, I think we had all had it. Like when the landlady pulled the plug and didn’t renew our lease it was like there wasn’t enough inertia and enough strength amongst each other to do the thing again. And also a realization that “you know…you can’t make this again.” You really would be forcing this, because this thing was so natural, and so much fun, and so one of a kind that you could hope, and you could try, but I don’t think that you could ever re-create what we had going over those 10 years. Jeff Treffinger: That’s a real terrible thing because I always felt and I know Pat[Cronin] always felt the same way, and absolutely too, Brendan [Gallagher], that it was so important to create an environment where odd things could happen; where unusual formulations could happen; where you could see things that you would never see again that were just sort of one-offs and were not formulaic. And that was by prescription. It became harder and harder to do that. Jeff Treffinger: Well because I think what happened is that Solar System started to…the planets started to form. Once Fingerbowl formed and became its own thing, well then Kevin O’Day and Alex were committed. They had a hard schedule. The Klezmers were touring, playing California. Galactic became huge. And prior to that, I think what was happening was that there was not stasis, in fact quite the opposite. There was something going on that was truly of that era. And there’s this great Zen koan “Every generation must die and a new one must come.” And very much that’s what happens. And that’s what happened. I think as someone who helped with the booking- I stopped booking the club in ’98- I had four or five years of booking the club and then Brendan was booking it and I was still looking for those kind of things but they were hard to pull off. How do you get 15 people to do 5 rehearsals for a gig where they are going to make $35? Jeff Treffinger: I don’t sense an environment that fosters the bizarre; that is willing to take a risk on not making money to produce something that nobody has ever seen or everyone would be amazed. I mean the Mermaid was notorious for having some of the greatest shows on earth that nobody saw. It’s hand in hand, and I think that’s what you’re talking about-and thats what I’m wondering about- is that there has to be the support of the people to generate the interest to do something extraordinary. And I think that, you know, we’ve all fallen into convention unfortunately-to some degree. I’m lucky, you’re lucky, you’re creative, you’re a composition person, you write, you explore, I have both music and architecture to bait that part of my brain. But I think many people have succumbed to a point of view that they are pretty sure what it is that they like; what entertains them. And that’s denying another possibility. So the situation of creative growth can be delicate and fleeting. It seems, though, that this city does itself a good deal by fostering and patronizing the bizarre, rather than making its cultivation difficult. Both the local legends and the unknowns were on the Mermaid’s stage and a lot of them were passing each other in the elevator shaft while there. Much of what starts out seeming bizarre, actually contains convolutions of treasures. It’s worth going to check out wherever it might be developing right at the beginning. It might not be- but it just might. This says good things about the more inquisitive tourist in the earlier part of the article. He is looking for the musical depth that is boasted of in our tourism information. We should maintain a depth of civic cultural and artistic life that allows someplace deeper for the tourist to go when he gets the urge. We need un-zoned areas of music unpredictability as well as the other. If not, then our well that could produce a Bongo Joe or something like a Professor Longhair and the Shuffling Hungarians is dried up. Being able to cook stuff up for preserving is far more relevant than the act of preservation because, it doesn’t need to have limits. We also risk presenting a fearful idea to young artists- that the best they can look for is not to practice music on the world stage as an relevant art form for all, but as a trade for tourists. If permits are more readily available then the city should be able to extract more revenue, if that is a concern. And, since the tourism industry is partly subsidized by revenue from permits and licenses there would be more of that in the coffers. Further, the city could develop in both directions since one set of arts and music would feed the showcasing function of the other. Art work itself could develop unchecked a little more. With this amount of talent in such a small area, freed from more parochial concerns, New Orleans could better and more naturally maintain its face on the world stage. Incidentally, they had a term that maligned people who went against boosterism. They were called knockers. We might find at this juncture that our safest bet for cultural development isn’t the booster, it’s the knocker, a natural-born committed musical dissident. Perhaps we need both; some people raising and cultivating geese that lay the golden eggs and some other people to serve endless golden omelets. The eggs won’t be in short supply.